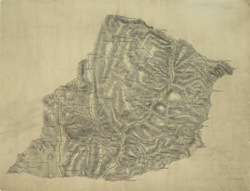 The military impetus of the Ordnance Survey is evident in the draughtsmen's preoccupation in detailing the lie of the land, not just its topographical features. Relief is indicated here by shading and the use of short disconnected lines drawn in the direction of the slopes - a technique called hachuring. Woods are coloured green. Red crosses and dots around the outer edge of the landmass indicate observation stations, which were used to plot distinctive features of the land being surveyed. The main roads are marked at mile intervals.